The beautiful picture you are looking at is known as “The Irish Madonna of Hungary.” The portrait itself is from Ireland, but it was brought to Hungary by an Irish priest, Bishop Lynch, who was fleeing English persecution in Ireland around the year 1652. Bishop Lynch worked for ten years among the faithful in Hungary, and just before he was about to return to Ireland he fell ill and died, bequeathing on his deathbed the portrait in question to the Bishop of Gyor in Hungary who hung the painting in the Cathedral of Gyor. The awesome miracle I am about to discuss involves this picture. The miracle in question did in fact occur on March 17, 1697 (St. Patrick’s Day) while “thousands were attending Holy Mass in the Cathedral of Gyor” (the year 1697 is highly relevant because in 1697 all priests were expelled from Ireland). 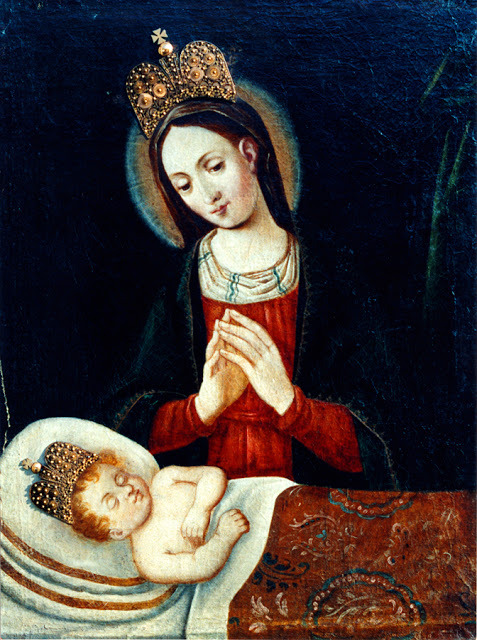 Our Lady of the Irish Madonna of Hungary, pray for us! Saint Patrick, Patron of Ireland, pray for us! Reference: For this note I am relying on pages 130-132 of Joan Carroll Cruz’s book, Miraculous Images of Our Lady (TAN), as edited.